The award winning Kinesis Maxim adjustable ergonomic computer keyboard is the only ergonomic keyboard licensed to use the Microsoft "combo" USB/PS2 technology. All Maxim keyboards are shipped as native USB, but include a PS/2 adapter for those systems that only have a PS/2 port. One keyboard now connects to any PC OS as well as legacy PS/2 systems. Much narrower and more versatile than "natural-style" keyboards. The Maxim accommodates a wide range of user preferences. Variable Split: Much more flexible than "natural-style" keyboards; no adaptation required. Select any opening between 0 and 30 degrees, a wider range than "natural-style" keyboards. By "splaying" the keyboard modules it positions your wrist and hand in a neutral posture greatly reducing ulnar deviation. Adjustable Lateral Tilt: Select 8 or 14 degrees - offering almost twice the tilt of the Microsoft Natural keyboard. This allows users to minimize forearm muscle tension (pronation) without the pitfalls of excessive tilt. Narrow Footprint: Your mouse is right where you want it - not at arms length! Even fully separated, the Maxim is narrower than the new "narrow" Microsoft Natural Elite. In a typical split configuration, the Maxim keeps your mouse significantly closer than with any "natural-style" keyboard, reducing over-reach issues. Removable palm supports. Comfortably padded to take the weight off your shoulders without hurting your hands and eliminating wrist extension. Quiet and Tactile Switches: Key switches provide a soft touch and positive feedback. Full n-key rollover supports maximum typing speed and multi-key combinations. Flexibility in Configuration: Adjustability allows the Maxim to conform to the user's preferences. Optional dedicated 10-key allows the user to position it where they want it. Great warranty. The Maxim carries a two year limited warranty. Compatible with virtually any PC system with an available USB port or PS/2 keyboard port. 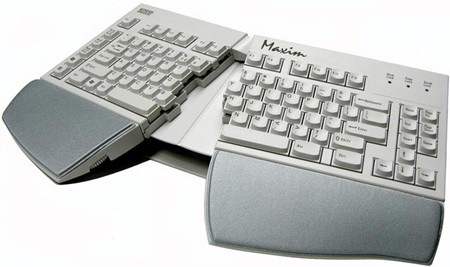 The Maxim adjustable keyboard is ideal where moderate-cost and multi-user ergonomic solutions are needed. Minimal adaptation time means no lost productivity for new users. Improved access to editing keys and closer positioning of the mouse means greater productivity and better employee morale. Long product life and reparability means excellent return on investment.